The Nisa modern globe outdoor PIR wall light in stainless steel, with a circular wall mount, matching two piece support arm, 20cm diameter white globe shade and integral motion sensor that only operates during the hours of darkness. With a built-in PIR motion sensor and photocell, this stylish outdoor wall light is just the job to help light an entrance porch or rear garden relaxation area. 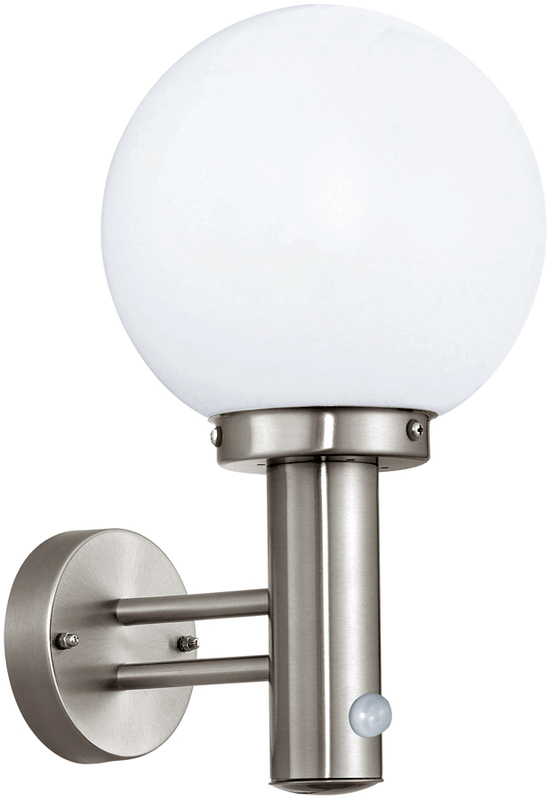 From the Nisia range of outdoor lighting products. Rated IP44 and suitable for outdoor use. Many thanks for your question. These fittings are not dimmable. All outdoor lights with a motion sensor are generally used for added security so they do have the facility to be dimmed. However we do have a light which maybe suitable for you, please click this link. This fitting comes on at a low light level during the hours of darkness and brightens up when the motion sensor is triggered, then returns back to its low light level. Kindest Regards, John. It says light can be usd with LED bulbs. Can the bulbs in this light be replaced.? This light has a E27 screw in lamp holder, so can take any lamp up to the maximum stated wattage, so replacing with an LED bulb will be fine.